Let me tell you what I found last week, although many of you in Singapore and Australia may be aware of it but for me it was something new and exciting. It is concept of sampling beauty products by receiving them every month at your door step packed in cute little box with a different theme every month. There are a few of these boxes moving around in Singapore, but let me tell you about bellabox (will talk about others later)! bellabox comes up with 5 luxury,cult and new products in make up, skin care and everything to do with looking and feeling beautiful. These products are handpicked for you only if you complete your beauty profile at the time of sign up. The subscription is fairly priced at S$19.95/month with 19 reward points or at S$219.45 for 12 months, with 219 reward points and one month free. Reward points can be used to make purchase at bellabox shop and every 100 points is equivalent to S$10. Sounds interesting isn't it?? 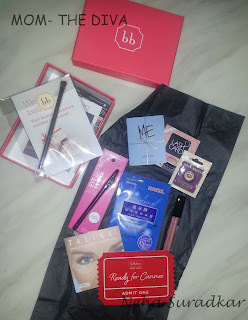 I signed up for bellabox and received my first box (May 2013) this weekend and let me tell you it looks great and it surely did meet my expectations. See how it looks like. I feel the concept is most suitable for those who love to try out new products and like to pamper themselves. 1. You get to try luxe and new products before actually buying them. 2. The box priced at S$19.95 a month gives you a good value for the money by sending out few sample sized products and a few full sized. 3. You get vouchers for other services like spa, beauty treatments etc. 4. If you fill up your beauty profile, the samples can be customized as per your needs and requirements. 5. The reward points can be used to buy full sized products) (that you have already tried and tested, from their online shop. 6. The excitement to open and see what surprises awaits you when you receive your box. 7. The convenience of sitting at home and getting to try new stuff...! 1. You are not sure of what exactly you are getting in the box. 2. Can't think of any other, will let you know if it comes to my mind! !